HANDS-ON LEARNING: A newly launched craft-brewing certificate program at Johnson & Wales University features two weeks of hands-on education at Isle Brewers Guild in Pawtucket. 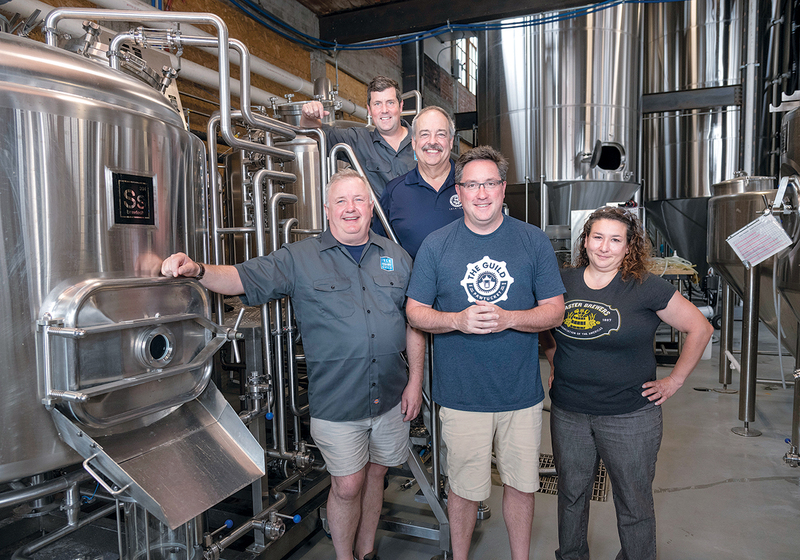 From left, Jack Streich, vice president, brewery operations, Isle Brewers Guild; Devin Kelly, co-founder and managing partner, Isle Brewers Guild; Ed Korry, department chair, beverage and dining services, Johnson & Wales; Jeremy Duffy co-founder and managing partner, Isle Brewers Guild; Jennifer Pereira, associate professor, / Johnson & Wales. For a time, every old industrial complex, barn, music hall or former train station was ripe for the picking, as the fervor for craft brewing spread across the United States like wildfire. And with it came Isle Brewers Guild. According to Brewers Association, a nonprofit based in Boulder, Colo., when the Pawtucket-based brewing cooperative opened five years ago, there were 2,898 U.S. breweries. By 2017, BA data measured the industry at 6,300-plus breweries – 98 percent of which were small or independent outfits. However, not all brews are paying off. The number of brewery closures has increased over the past two years, with 165 shuttering in 2017 and 97 closing in 2016. Looking forward, he expects the closure trend to increase, which makes it all the more interesting that Isle Brewers Guild and Johnson & Wales University chose late 2017 to strike a partnership, offering an online craft-brewing certificate, including hands-on training at the Pawtucket facility. The program began 14 years ago when JWU associate professor of beverage and dining services Jennifer D. Pereira started building the breadth and depth of the university’s brewing courses. While the first cohort of certificate students launched in September, the Isle Brewers Guild partnership was finalized in the spring. At 22.5 credits, the program consists of four, 11-week courses. The first two components, brewing arts and advanced brewing theory and analysis, are in-person, 4.5-credit courses. The third component is an online course detailing the business structure of the alcohol production industry. In the final component, a 9-credit course, students are given the choice to travel to the United Kingdom for three weeks or complete two weeks of hands-on study at Isle Brewers Guild. As of late June, Pereira said her two fall 2018 sections of brewing arts are already 80 percent full at 32 people. “Normally, that doesn’t happen until a couple weeks before term,” she said. In fact, with each subsequent 2017-18 semester, she added, more students signed up for the program. The majority, 60 percent, said Pereira, are “non-matriculating, continuing education students” representing a range of 18- to 20-year-olds and people in their 50s and 60s. With once-per-week classes from 6-9:30 p.m., Pereira designed the program to accommodate working professionals. She is also pursuing G.I. Bill approval with Veterans Affairs, which will “increase availability” to an even broader swath of the public. While she is enthused by the growing interest in her program, Pereira said the hands-on nature may weed out those not fully committed. Calling professional brewing “a lifestyle choice,” she said, a lot of people are attracted by that, but it’s a real business and if people are not prepared for what it takes to succeed,” that’s when breweries shutter. For Duffy, who operates in the industry every day, the certificate program meets a pressing need. “A lot of brewers are homebrewers by nature or there have been individuals that have been brought on to breweries and are learning on the fly,” he said. American Homebrewers Association data found 1.1 million U.S. residents identified as homebrewers in 2017 – 40 percent of whom took up the hobby after 2013. In 2016, there were 1.2 million homebrewers in operation across the country. Educational models such as the partnership with JWU, he believes, will provide necessary introductions prior to production. Where Duffy believes sustainable growth will occur is in craft breweries that do not distribute but rather rely on patrons to visit and purchase at their headquarters. One such craft brewery is South Kingstown-based Shaidzon Beer Co. Not yet a year old, founders Josh Letorneau and Chip Samson both have homebrewing roots. Letorneau even completed a similar certificate program, which he said gave him a strong footing in the hands-on-heavy industry. Samson, a South Kingstown native, said, “In my youth there wasn’t anything of breweries in the state.” But, after living in Denver and Boulder for 12 years, cities “comfortably [operating] with much more craft-brewing culture,” he said Rhode Island has yet to hit its saturation point. Next articleIs simplifying R.I. regulatory approach finally happening?